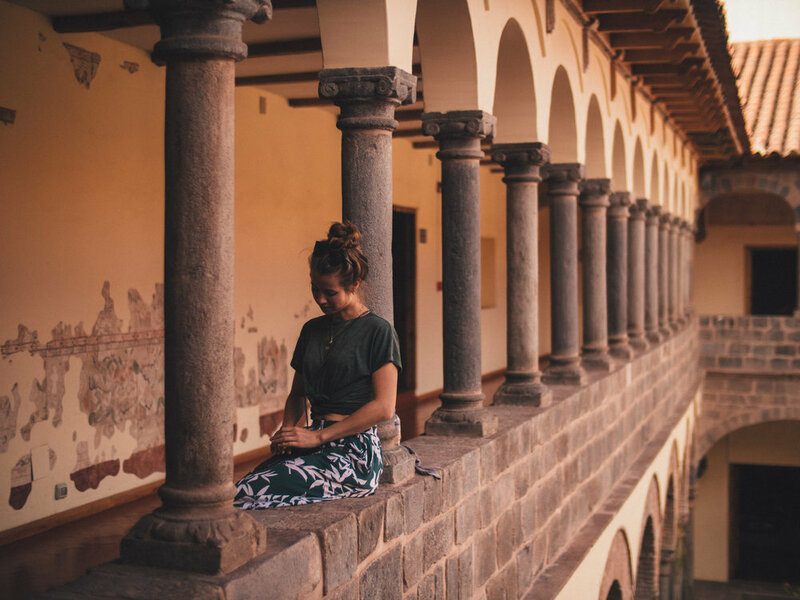 Cusco is the historic capital of the Incan Empire and the central hub of the Sacred Valley where most of the best preserved remains of the Incan civilisation are situated, including Machu Picchu. After many days of rain cycling through the wettest month of the rain season I couldn’t wish for a better place to wind down and soak up the history. 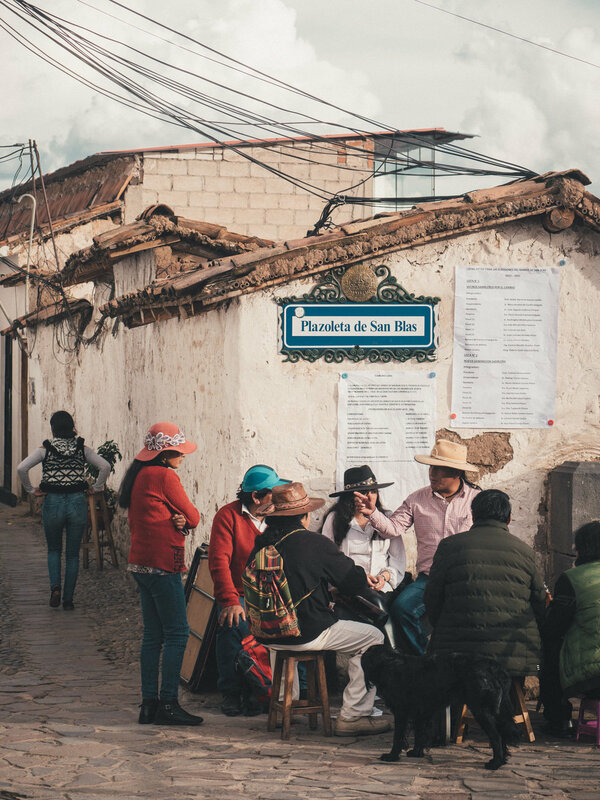 There are just a few hands full of locations in Peru where cafes don’t have a loud tv on the wall, where the somewhat obnoxious reggaeton is generally ‘banned’ and music is properly levelled to the chit-chat of the clientele and the crush of the coffee grinder. The clientele is usually foreign, in practical outdoor wear, or shorts and flip-flops, even it’s too cold for that. These are towns with a so called tourist infrastructure, where you can have a perfect latte for double the price of a complete meal in the rest of the country. If you’re a backpacker, you usually only spend time in these kind of places, from where tours can be easily organised to visit the well-known landmarks. Travelling by bicycle, however, you spend most of the time amongst the reality of 3-world countries, sometimes uncomfortably far of those luxuries which are an everyday-thing at home. When I a was a few weeks on my way into Peru I had downloaded ‘Lonely Planet Peru’ to get me warmed up to what was on offer. I read about the seemingly countless options of delicious food I thought, what are they talking about — I only had dry rice and beans with a piece of overcooked chicken or beef! It’s obvious that on a bicycle, travelling the B-roads you get to see the real, raw part of a country, which often isn’t that flattering and sense-tickling as the travel guides promise. That doesn’t mean that once I reach a town like Cusco, I revel in it. Stepping out of the door of my hotel I can choose to have Indian or Thai food. Some cafe’s have a proper selecion of IPA’s and other craft beer. Also the wifi works just like home, so I can get some work done and perhaps catch up on a show on Netflix. The bicycle touring life is somehow reversed to normal life. On Instagram I captioned a post with “Taking some days off to get some work done.” Someone pointed out how weird sounds. That working now means taking a day. To do this I need a certain level of comfort. A room with a table and chair, stable wifi and quieteness. Believe it or not, that combination is sometimes a hard find, being on the road in South America. 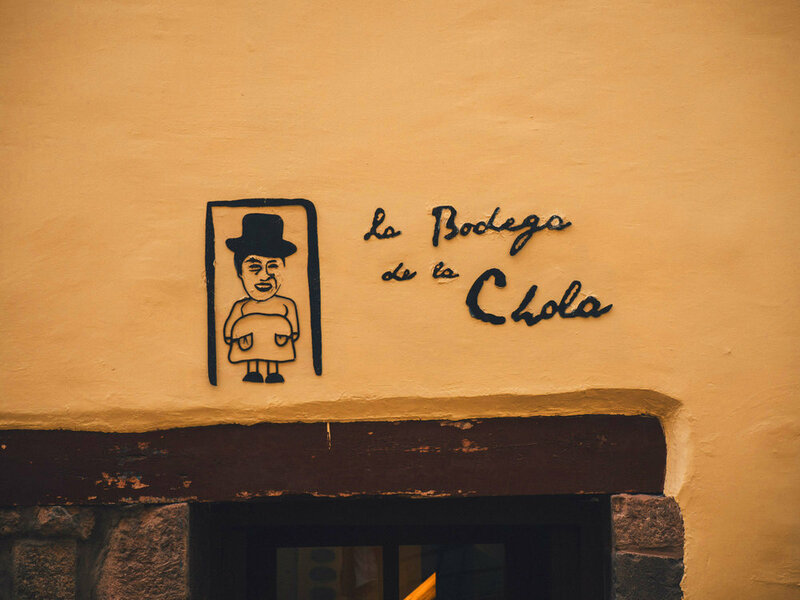 Cusco is packed with historic landmarks. 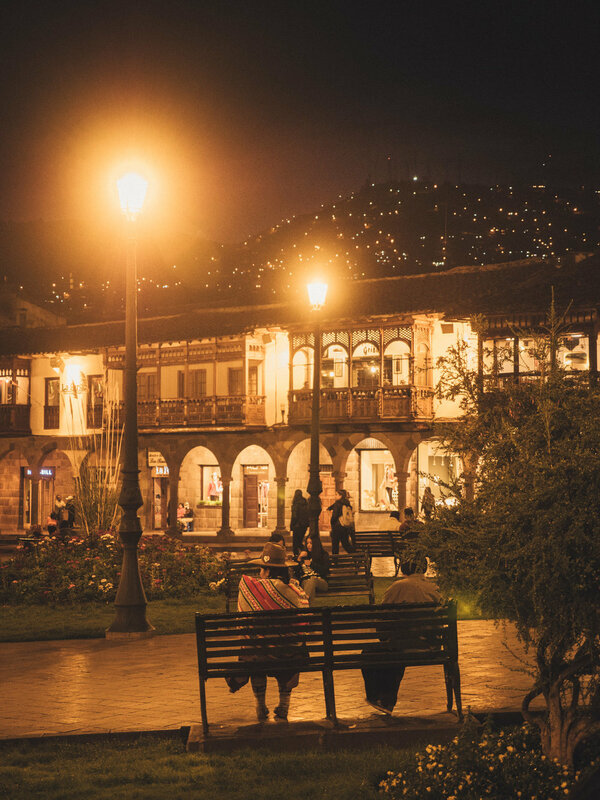 The colonial houses are built on some of the remains of the derelict Incan structures. 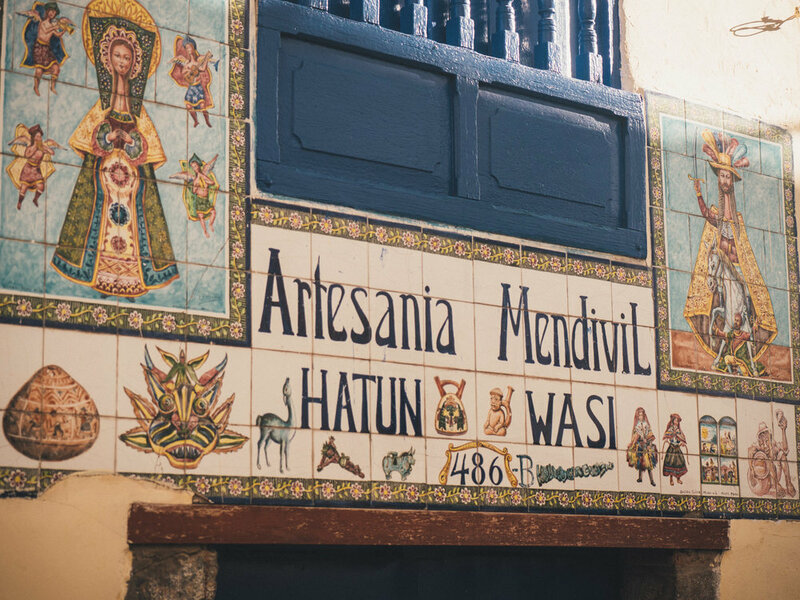 You can still see the iconic stonework at the base of some of the walls, that looks like a jigsaw puzzle — the old and new world married together. Plaza de Armes, the main square with the two colonial churches, is the busy and social center. Peruvian women are trying to persuade you for a massage at every street corner. 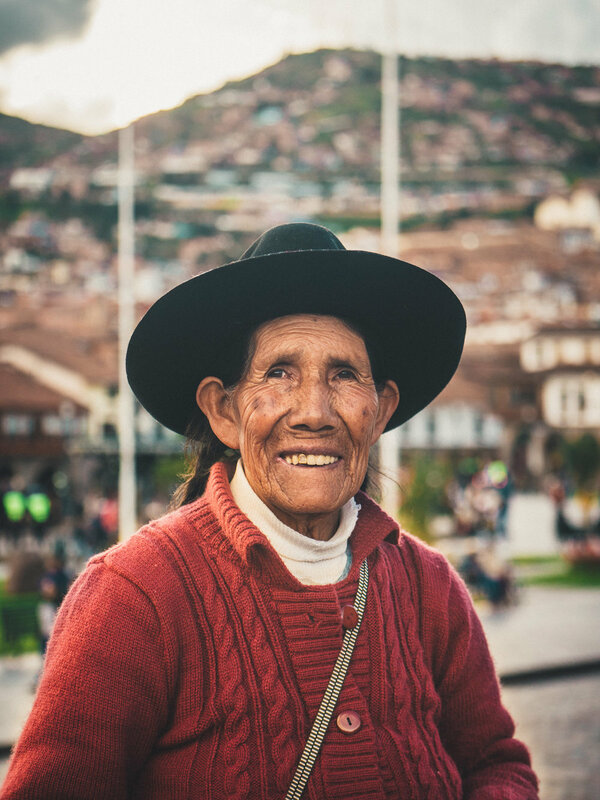 “Masaje, amigo?” Also many indigenous people come to Cusco to sell their colourful crafts and garments. On the first day I buy a sweater of alpaca wool. The next day I see all the tourist walk in the same sweater. I’m not alone in Cusco. The first days I hang out with Mark & Hana, cyclists from New Zealand. Later I meet Cecilia, who is Dutch. It’s funny that I meet her here, while she lives in basically the same neighbourhood in Amsterdam. We seem to live in completely different worlds, from the thousands of social media acquaintances we both have, we share none. She’s a singer, actress and long-distance cyclist too. She crossed Europe on her bike last summer, so we have a lot of stories to share. We soon become buddies and explore a lot of places together. The San Pedro market, packed with local fruit stands, tiny restaurants where mostly local people eat. There’s a great energy here, of salesmen and vendors trying to sell their products. Once we walked through the butchers alley, where chopped-off cow and pigs noses lay bare in the warm sunlight amongst piles of red meat, we moved on. The hygiene laws in these mercados, if there are any, are not taken very seriously. Our apartment is a stiff walk up cobble stone stairs in San Blas, one of the oldest neighbourhoods on the north hill. You’re out of breath in no time at this altitude, but coca tea helps against the altitude sickness. A French balcony provides a pretty view over the city, which is situated in bowl. We watch the dancing lights in the evening. As beautiful as the view is I know I don’t want to be on the other side, where the stray dogs roam the steep alleys, full of trash and garbage. The traffic and tv screens loud en flickering, echoing through the damp restaurant with concrete walls where people sit inside with their jackets on. I had cycled here the other day and thought I was in another town. 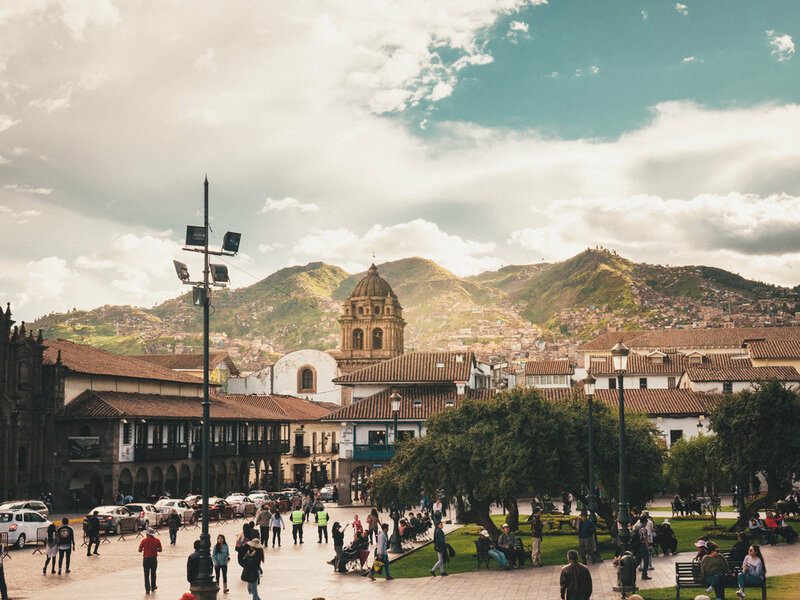 Cusco is a city of contrasts, the tourists area resides entirely in the compact historic centre on the west side of the city. A few days we spend here. I have work to do. A graphic design project, a book-editing job, administration and I needed to make sure my Airbnb in Amsterdam was still running smooth. I embrace the temporary bubble of comforts. I call it a bubble because it contrasts so strongly with live on the road, where I’m alone, eat basic food, sleep outside and cycle most of the day. After this break, which I will extend for a bit in the next city Arequipa, I will continue in the dry season.